This is a very simple Electronic Alarm Circuit Project of piezo alarm circuit, which will generate a sound around 110dB can be designed using this diagram. This Piezo alarm siren circuit project use two piezo sounders with high efficiency and can be powered from a wide input voltage , between 5 and 15 volts . 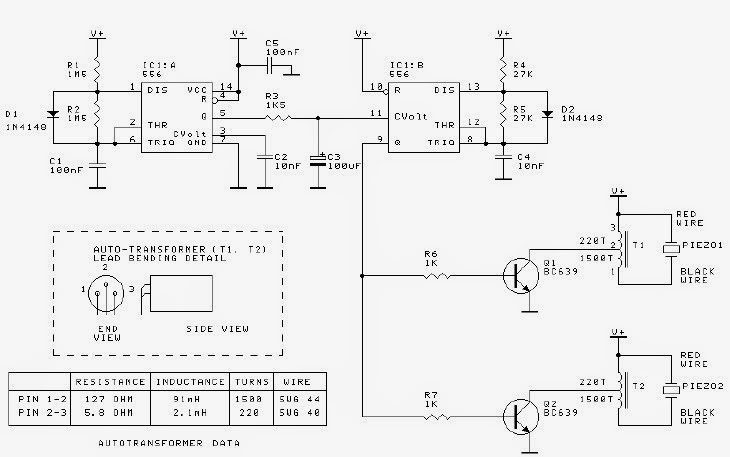 This circuit is very easy to build , maybe you will have a little trouble with the T1 and T2 autotransformers . Both autotransformers used in this project are the same type and require between pin 1and 2 1500 turns of 44 SWG wire and 220 turns between 2 an 3 using 40 SWgG wire. In this circuit the IC1:B closest to the piezo elements is set to oscillate around their resonant frequency. The frequency is then varied via input pin 11 from the other 555, IC1:A. This modulating input is a low frequency oscillation. However, instead of using the square wave output from the first 555, the step function is converted to a triangular wave by the RC network R3 & C3 . The result of this is a frequency swept output which ensures that the output frequency definitely passes through the resonant frequency of the piezo elements sometime during each modulation cycle.